With cutting edge technology, earth shattering equipment list, attention to detail and a new sinister powerplant, looks like the Brits have concocted a winner. Designed to be an addictive and intuitive performance street motorcycle, Triumph’s attempt here is authentic. Keeping the character and the looks of the Street Triple alive, this new edition retains the overall silhouette but gets a fresh new attitude with sharper poise, contemporary and aggressive lines throughout the bodywork. More like the bike hit the gym every day to get those definitive cuts and lines. 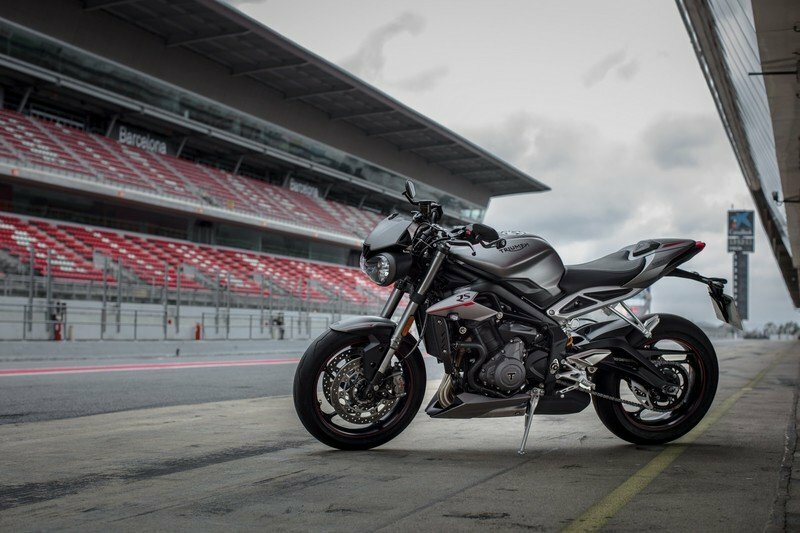 It is pretty safe to say that the Street Triple was arguably one of the best-looking roadsters designed by the company and we especially liked the twin headlights, the angular windshield and sharp lines of the body, of which makes the scene even in the new one. Thank God. The twin pod headlamp unit is tweaked to get a more aggressive stance and now also features new distinctive LED Daytime Running Lights (only on the R and RS). 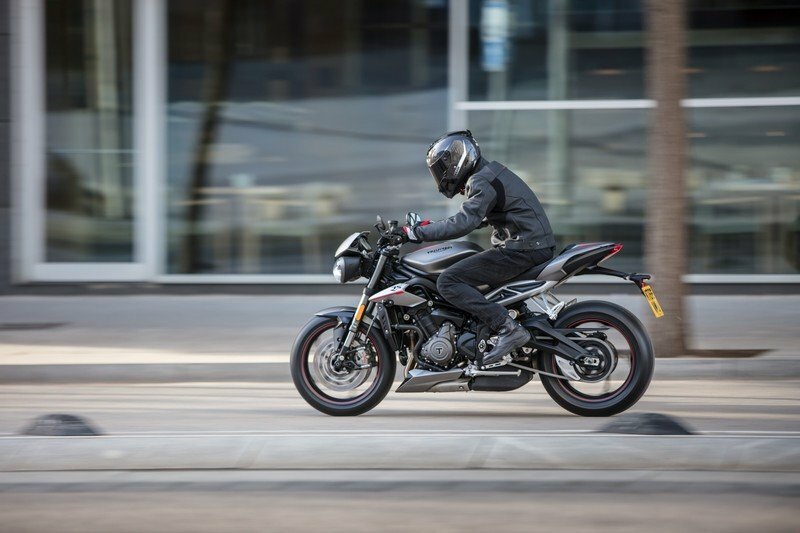 Said to have been inspired by the ‘nose-down’ focused attitude, the Street Triple showcases significant styling evolution over its previous generation. It gets all new bodywork, flyscreen, radiator, cowls and integrated air intake. It also gets a newly designed twin saddle setup that is both sharp and comfortable to both rider and pillion. The RS version further gets colour coded belly pan, pillion seat cowl with interchangeable pillion seat and lower chain guard. Triumph is one of those who understands and respects the fact that the little finishing touches, detailing and craftsmanship give the bike a panache in its own way. 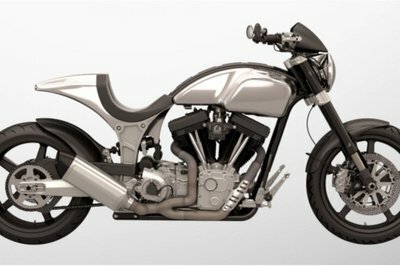 The level of finish across the entire motorcycle is tremendous and comes with many high-quality details. Individual colour coded rear sub-frames, rider heel guards, forged pillion footrests, quality switchgear, red pin striping and more. This new edition retains the overall silhouette but gets a fresh new attitude with sharper poise, contemporary and aggressive lines throughout the bodywork. More like the bike hit the gym every day to get those definitive cuts and lines. Then there is the 5” full-colour TFT instrument cluster (R and RS only). The adjustable angle panel allows the rider to have customised styles and access to the new on-board computer that gives all the information under the sun straight to the rider in an intuitive and fun way. There are three different screen display styles to choose from, pre-set to the riding modes and changeable easily on the move. The S variant gets a thoroughly revised LCD instrument pack. The RS variant additionally comes with three more screen display styles and a lap timer. All of which can be navigated using new switch cubes with an intuitive 5-way joystick control that have been ergonomically optimised to be easy to use. 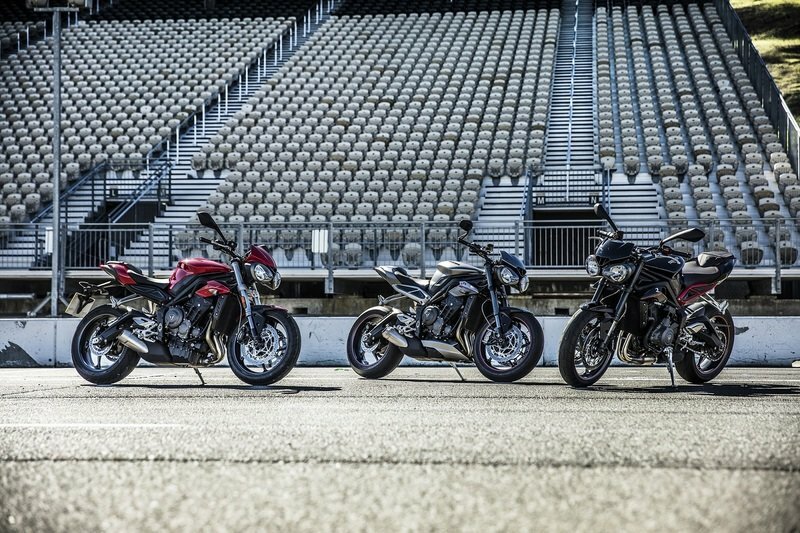 Designed to be an addictive and intuitive performance street motorcycle, the Street Triple comes with three different settings, the S, R and RS. Each of them is tailor made for different sets of riders requiring a unique setup of riding styles, engine performance and riding dynamics. All of them carry a 765cc powerplant, again derived from the brand’s Daytona 765, which has more power and a better performance package compared to the outgoing model. The thrilling new race-bred triple engine comes with three levels of power and torque figures: the ‘S’ tune gets 111 bhp, and 54 lb-ft perfect for everyday riding, the ‘R’ tune with its own crankshaft gets 116 bhp and 57 lb-ft for a full-on focused road riding. 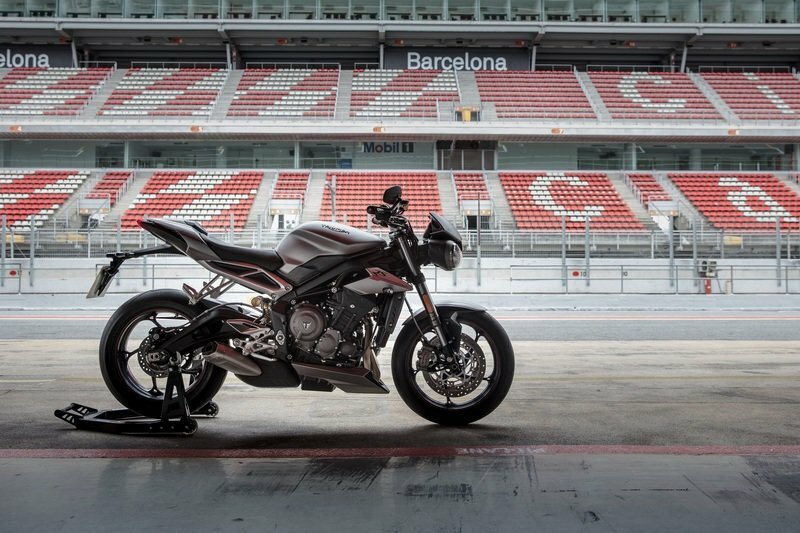 The RS variant is the most powerful one around which gets a whopping 121 bhp and 57 lb-ft of torque making it feel closer to the litre-class counterparts, courtesy of a unique engine set-up, ECU and tune and is the most explosive Street Triple built by the British legends. 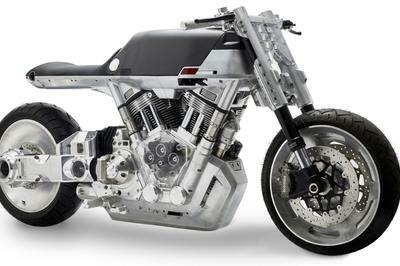 The new triple features 80 new parts including new crank, pistons, aluminium barrels and an increased bore and stroke. All of this makes the performance bump, particularly low-down and in the mid-range. Revised gear geometry help the bike achieve stronger acceleration and gear changes on this are said to be as slick as ever. In addition, the R and RS gets a new slip and assist clutch set up for a lighter clutch action and higher riding experience. 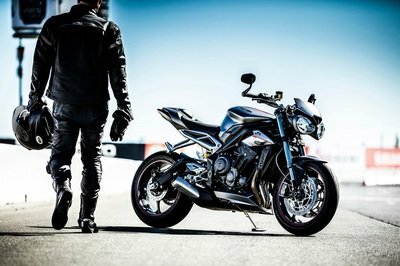 This new Street Triple focusses on state of the art rider-centric technology giving everyone maximum control and safety. 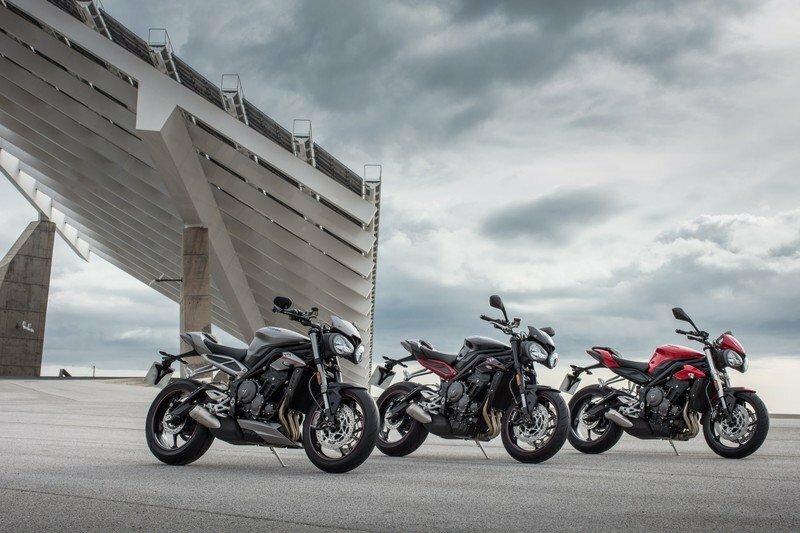 Triumph has equipped the Street Triple with ride-by-wire for precise throttle response and improved on/off throttle transition. The RS gets an additional quick shifter allowing for clutchless upshifts, which can also be accessorised to the S and R.
It goes beyond my imagination of how triumph managed to get out a whopping 121 bhp out of that 765cc three pot. It must be some kind of wizardry and witchcraft. Then there is the free flow exhaust unit that sits right under the belly and pops out to give you an intoxicating and more distinctive induction howl. It is made up of a lightweight stainless-steel unit and promises to give a richer soundtrack along with the revised airbox. 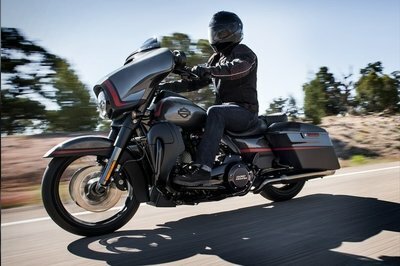 Making the bike ride like a breeze, Triumph has updated the machine to be the lightest amongst its peers in the class. Having one of the best power-to-weight ratios has its perks, and one can feel it by the easy rideability this thing has to offer to anyone throwing a leg around. Giving it a precise and stiff chassis setup, the Brits have delivered a truly explosive and agile tool for your road and track use. It gets a model specific brand-new gullwing rear swingarm that takes care of the longitudinal torsional stiffness, combined with an engineered reduction in lateral stiffness. 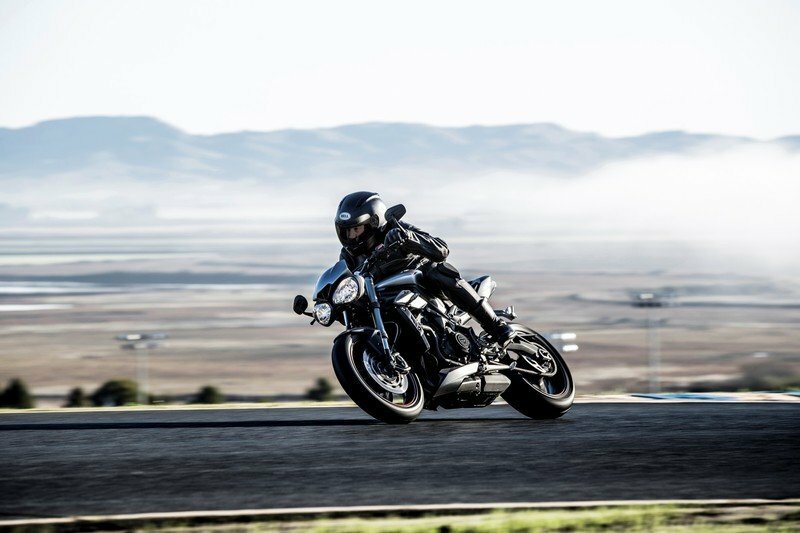 All of this makes the Street Triple achieve maximum stability and in turn rider confidence to crunch those apexes for breakfast, lunch and dinner. Mechanically the Triple S is fitted with a 41mm Showa USD forks, a mono shock unit attached to a new ‘Gullwing’ swing-arm, Nissin sliding callipers on Brembo brake units and premium Pirelli Diablo Rosso Corsa tyres. The R additionally gets a Showa Showa piggyback reservoir mono shock unit. The RS, on the other hand, moves around with the highest- specification 41mm front forks, adjustable for preload, rebound and compression damping, premium Öhlins STX40 piggyback reservoir mono shock, range-topping Brembo M50 4-piston radial monoblock callipers and premium Pirelli Diablo Supercorsa SP tyres. Other rider aides include riding mode setups that are linked to the ride-by-wire setup, traction control and ABS systems. The S features two levels: Road and Rain, the R gets four: Road, Rain, Sport and Rider Programmable. The RS, meanwhile, has five modes: Road, Rain, Sport, Rider Programmable and Track. The traction control setup can also be managed by the instrument panel each with a dedicated level of traction control built in. Having one of the best power-to-weight ratios has its perks, and one can feel it by the easy rideability this thing has to offer to anyone throwing a leg around. 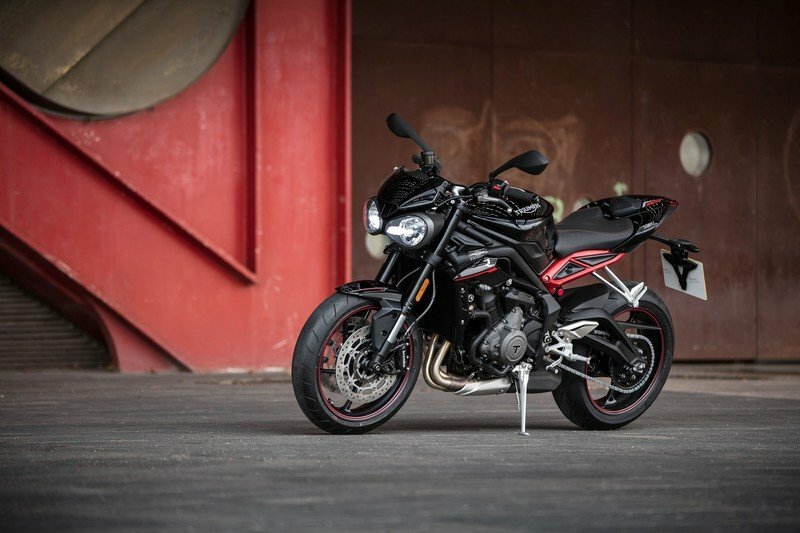 The Triumph Street Triple S variant is available in Diablo Red and Phantom Black (Metallic) and will fetch $9900. You will find the R with Jet Black (Gloss), Matt Aluminium Silver and Crystal White colour options and will be priced at $11200. The top spec- RS variant will also be featuring the highest level of finish with Matt Silver Ice and Phantom Black (Metallic) colour coded belly pan, colour coded pillion seat cowl with interchangeable pillion seat and lower chain guard and can be yours for a cool $12500. Triumph confidence provides you with a two-year unlimited mileage warranty on your new Triumph and Genuine Accessories. Alongside the knowledge that Triumph gives you a 12-month unlimited mileage warranty on replacement parts. You can also accessorise your select with over 60 different accessories available, selectable via Triumph’s online configurator. One can make it even more appealing that it already is with accessories including Arrow exhausts, colour coded seat cowl and swing arm protector kit. 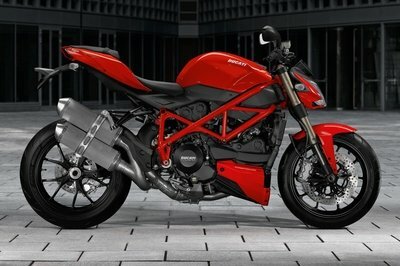 Years have passed, and Ducati, in order to expand its global presence, came with Monster 795 a few years back. The Monster 795 was specifically crafted keeping the emerging markets of developing nations in mind, including that of India. In Ducati’s previous stint in the Indian market, the Monster 795 was pegged as the most significant model of its lineup, primarily due to its affordable pricing. 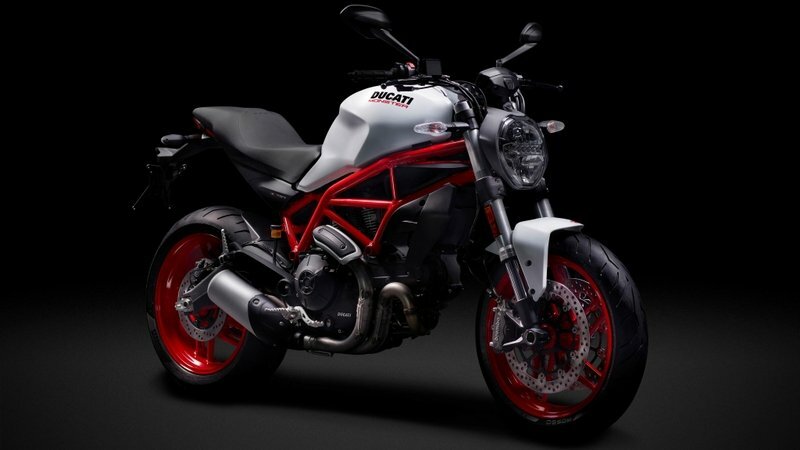 Touted to be the spiritual successor of the Monster 795, the Monster 797 has replaced the Monster 821 as the most affordable model of the Monster family and will co-exist with the Scrambler series to act as the perfect gateway to be a part of the Ducati family. The Monster 795 comes bolstered with the same four-stroke, L-twin, air cooled, fuel injected, 803cc engine which powers the entire Scrambler family. This engine, on the Ducati Monster 797, pumps out 75 bhp of maximum power and 51 lb-ft of maximum torque. The engine is coupled to a 6-speed gearbox, which has shorter ratios to unleash the fun this motor packs in, especially in the upper rev range. 43 mm, inverted Kayaba forks push the wheelbase out to 56.5 inches. Symmetrical, 17-inch, cast-allow wheels come in a ten-spoke configuration that’s both stylish and lightweight with Pirelli’s Diablo Rosso II tires for the final connection to the pavement. Sachs provides the rear monoshock, and it comes with the courtesy spring-preload adjustment plus adjustable rebound damping. Dual, four-pot, Monobloc Brembo callipers bite huge, 320 mm front discs for the bulk of the stopping power with a single-pot calliper and 245 mm disc to slow the rear and all-around Bosch 9.1 MP ABS protection as part of the standard equipment package. The factory keeps prices just below the $10K mark with a $9,295 sticker on its base “Red” model. Various trim levels are available that can carry the price as high as $9,895, and of course, there’s always the accessories catalogue to drive it up even further. This first-year run can be had in red, Star White Silk or Dark Stealth. 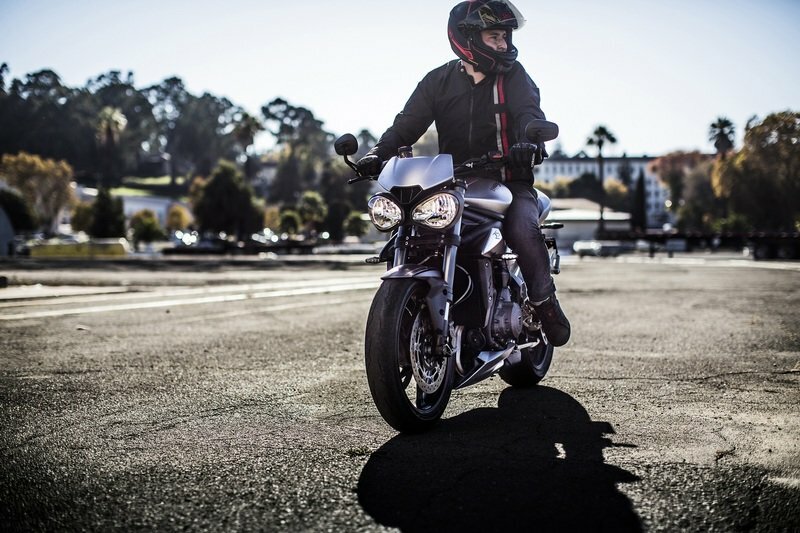 For a company that has been making iconic motorcycles that offer a blend of authentic design, character, charisma and performance for over two decades, Triumph can finally take pride in knowing that they have made their most exquisite, and intuitive performance street motorcycle for a long time to come now. 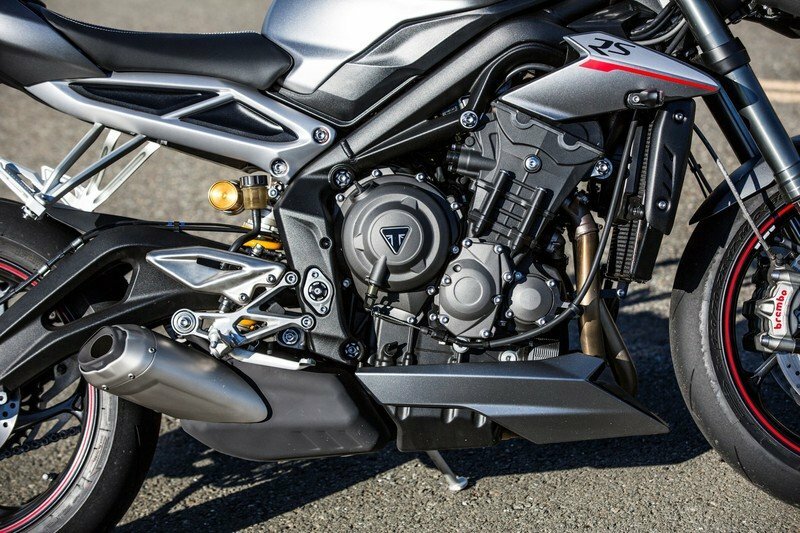 With this, Triumph has completely obliterated the competition with the mad powerplant that they have equipped the Street Triple with. It goes beyond my imagination of how triumph managed to get out a whopping 121 bhp out of that 765cc three pot. It must be some kind of wizardry and witchcraft, because this very engine is also going to power the Moto2 Championship bikes later on in 2019, and they will pump out a massive 130+ bhp figures. There is no competitor for a thousand miles apart that could come any close to the way this motorcycle performs and handles. They have literally changed the game by tearing up the rule book and creating a motorcycle that can easily benchmark the whole roadster/streetfighter category in all departments, be it design, equipment, fit and finish and most important of all, rider satisfaction and pleasure. And by the looks of it, they might have just managed to pull one over the Beemers and the Ducatis. And how! That folks, is a statement. They have literally changed the game by tearing up the rule book and creating a motorcycle that can easily benchmark the whole roadster/streetfighter category in all departments, be it design, equipment, fit and finish and most important of all, rider satisfaction and pleasure. performance street motorcycles Triumph has ever made. o	Higher quality finish and detailing throughout with new premium colour schemes. 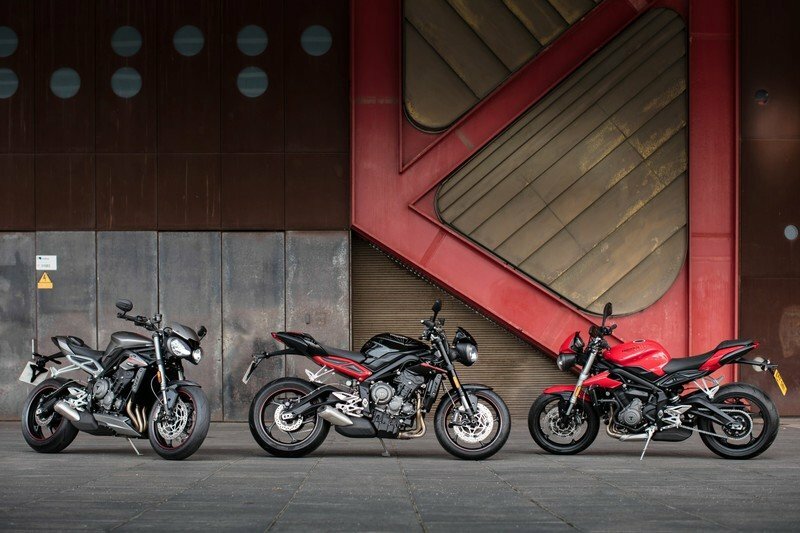 Introducing the Street Triple S, Street Triple R and Street Triple RS, each with their own unique tailor made level of power, performance, technology and suspension. All backed up by Triumph’s highly regarded capability, confidence and agile control. and seating set-up, and also a dedicated A2 license version for the ‘S’ with its own unique 660cc engine, for riders who don’t yet hold a full license. 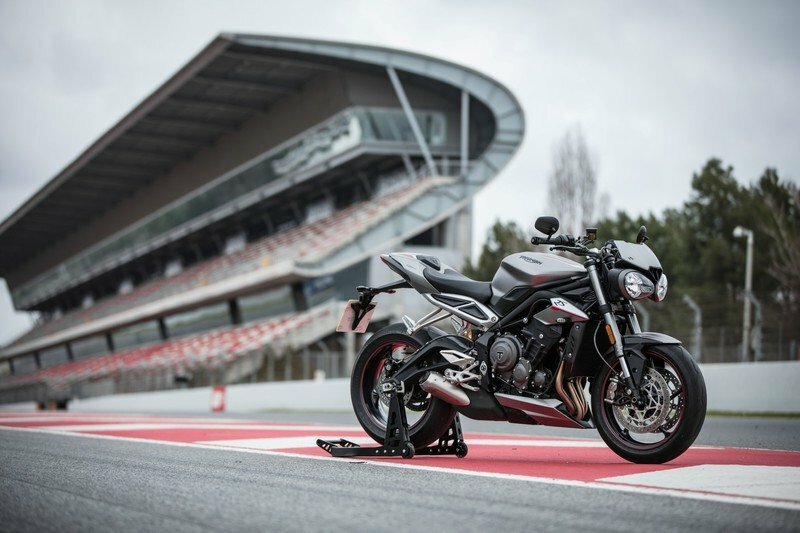 Street Triple S Built to deliver a thrilling, agile and addictive everyday ride. With its new street fighter looks, the highest level of finish ever, lighter than its predecessor with higher spec brakes, tyres, suspension and all-new gullwing swingarm. Street Triple R Taking the performance, specification and finish to an even higher level, built to be the definitive street fighter with a specification and set up for focused road riding. built to be at home on the track, and a weapon on the road. The ‘R’ tune, with its own model-specific crank shaft, increases peak power by up to 11.3% over the previous ‘R’ model, delivering 118PS @ 12,000rpm, and delivers a 13% increase in peak torque at 77Nm @ 9,400rpm. The ‘RS’ tune delivers the highest level of performance ever for a Street Triple, with a power increase of up to 16% over the previous model, delivering 123PS @ 11,700rpm and a peak torque increase of 13%, providing 77Nm @ 10,800rpm. revised gearbox geometry and shorter 1st and 2nd gear ratios. In addition, on the R and RS models, a new slip and assist clutch set up delivers lighter clutch action and reduced lever effort for more control and riding comfort. Street Triple S featuring 2 riding modes: Road and Rain. TFT instruments colour 5” TFT instruments for riders to access the new on-board computer. There are three different screen display styles to choose from, pre-set to the riding modes and changeable easily on the move. To ensure that the screen is readable in all weather and light conditions, each of the three styles can be selected with ‘High’ or ’Auto’ contrast. New on-board computer	For the ‘S’ model this delivers a speedometer, rev counter, riding mode symbol, gear position display, fuel gauge, odometer, trip meter and journey distance. On the ‘R’ and ‘RS’ models this presents additional features including two trip displays, average and instantaneous fuel consumption, range to empty, riding mode selection, display style and contrast settings, service information, coolant temperature, warning symbol information and also for the ‘RS’ model only a lap timer. with 5-way joystick all-new switch cubes with an intuitive 5-way joystick control that have been ergonomically optimised to be easy to use. and track ABS settings) or can be turned off completely if desired. traction control instrument menu, by selecting ‘road’ or ‘rain’ riding modes, each with a dedicated level of traction control built in. Quickshifter The new Street Triple RS is fitted with a quickshifter allowing for clutchless upshifts that are up to 2.5 times quicker than a skilled rider using a standard clutch upshift. This can be added as an accessory option on the Street Triple S and R.
DRL Headlight The new Street Triple line up all feature new headlights designed for a more aggressive stance. The Street Triple R and RS featuring new distinctive LED Daytime Running Lights (DRL*). These bring an eye catching new light profile that makes the bike more easy to see out on the road and a lower energy consumption for greater long term durability. The DRL is an amazing 28x brighter than the previous generation bulb sidelight. *Please note that the DRL function is not available in all markets – please check with your local Triumph marketing representative. Gear position indicator	The Street Triple R and RS feature a useful gear position indicator, accessible through the 5” full colour TFT instruments. the new higher power 765cc engine delivers an amazing power to weight ratio that is key to the game changing performance of the new ‘Streets’ delivering a truly explosive and agile ride. lateral stiffness. 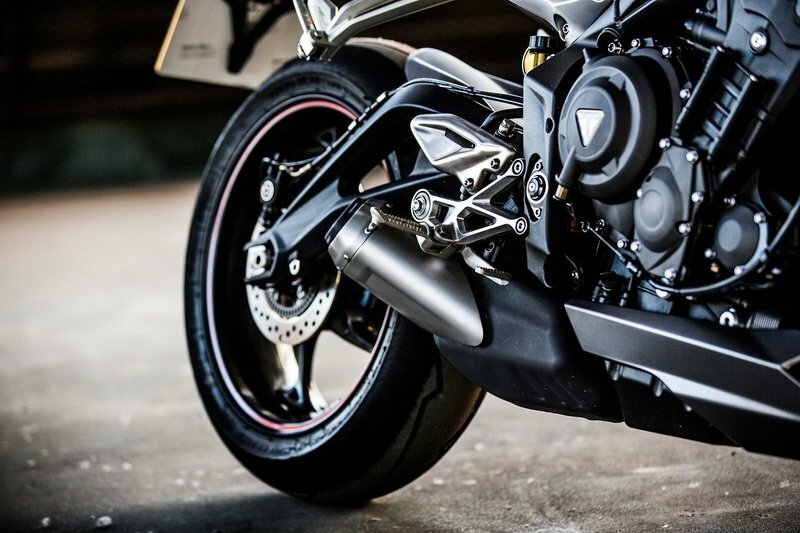 This maximises stability at the higher speeds achieved by the new Street Triple, for greater rider confidence, with an optimised swingarm pivot position providing more natural resistance to compression of the rear suspension unit under hard acceleration. This brings a tighter corner exit capability and a more precise chassis behaviour, which can be felt on both road and track. and a Showa piggyback reservoir monoshock rear suspension unit. a premium Öhlins STX40 piggyback reservoir monoshock. single piston sliding caliper on the back. radiator, cowls and new integrated air intake. In addition, the seat has been redesigned and restyled to deliver a sharper, sportier separate twin seat set-up without sacrificing rider or passenger comfort. re-designed rider heel guards and forged pillion footrest hangers. The Street Triple RS delivers an even higher level of finish with colour coded belly pan, colour coded pillion seat cowl with interchangeable pillion seat and lower chain guard. With over 60 accessories available, selectable via Triumph’s online configurator, riders can take their Street Triple to an even higher level of specification and capability with accessories including Arrow exhausts*, colour coded seat cowl and swing arm protector kit. *Availability of Arrow silencers is governed by local market legislation – please check with your Triumph market representative for availability.